It’s safe to say that almost everybody has experienced the joy of PEZ at least once in their childhood. And for those who didn’t? Well, it’s never too late to step into the Wonderful World of Pez, as is made more than clear by the number of incredible personal collections out there. With that in mind, let’s take a few of what we consider to be the “sweetest” PEZ collections in the world. Check out Frederich Emmerich’s video tour of his PEZ collection. An entire room is barely enough to contain it, and it takes him more than 5 minutes just to show a glimpse of each dispenser. We also love the mix of vintage and new editions—after all, age is just a number baby! Most diehard collectors consider rare retro PEZ dispensers to be the most sought after pieces in any respectable collection, but this isn’t true for everyone. Ran Eyal, based out of Israel, posted this video of the collection he’s been growing for the past few years. He became a “PezHead” on November 15th 2008, but he already has a very impressive modern PEZ family! 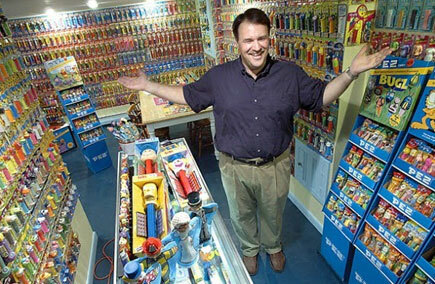 Ron Hood’s basement in Lewiston, Maine looks more like a candy shop than a collection display. The collection includes more than 3000 PEZ dispensers and PEZ related merchandise, all in their original packaging. The most surprising part? Hood confessed in a 2008 interview, “My collection is actually considered very small in PEZ-collector circles”. Bruce Goad of Berryville, Virginia might not hold the title for the largest PEZ collection in the world, but he does hold the title of honour for “Most PEZ dispensers knocked down in a domino chain” according to www.recordsetter.com. You can see his 41 dispensers go tumbling in this video. If you’ve got 42 dispensers laying around the house that you don’t know what to do with, maybe you can be the next record holder!